What is the most peaceful sound you have ever heard a dragon make? 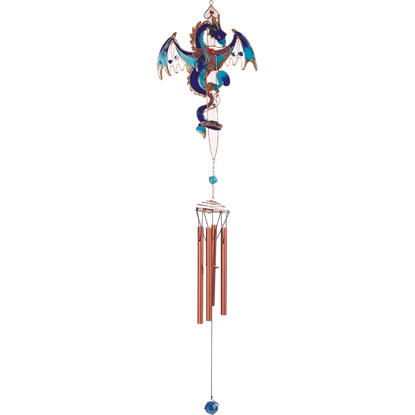 Whatever it is, it likely does not quite compare to the soothing, dulcet, and oftentimes haunting chimes that can be heard anytime the wind gently billows through our dragon wind chimes. 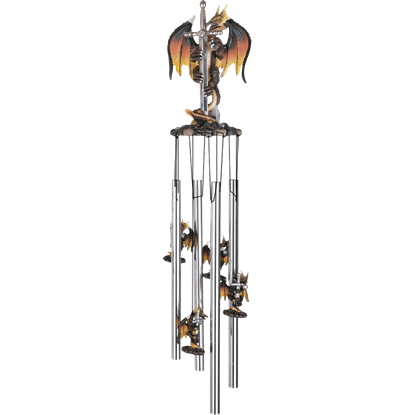 In many ways, these dragon chimes are as peaceful as most enthusiasts will ever see dragons, and these chimes do their best to transfer that peaceful, beautiful look into their watchers via the soft clinking of the chime. 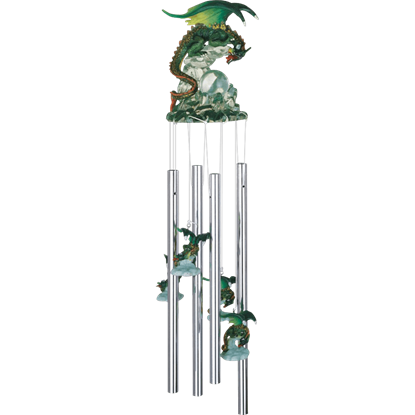 Our dragon wind chime section contains a range of dragon styles, displaying all manner of different colors and poses. It has been said that music can sooth the savage soul, and if that is true, then these dragon wind chimes are just the thing to bring a sense of calm not only to their own dragon shapes, but also to all those who listen to them. 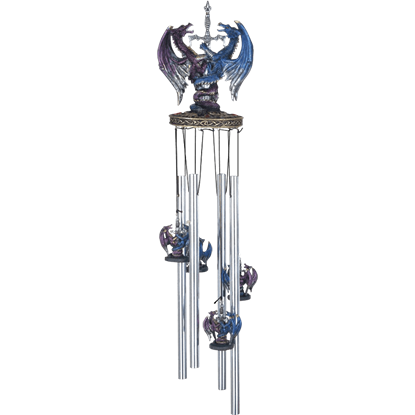 Your home may be missing a touch of fantasy, so consider the Blue Dragon Chimes as an elegant solution. This colorful item can provide your home with a unique look and soft melodic tones that will sooth any who walk by. 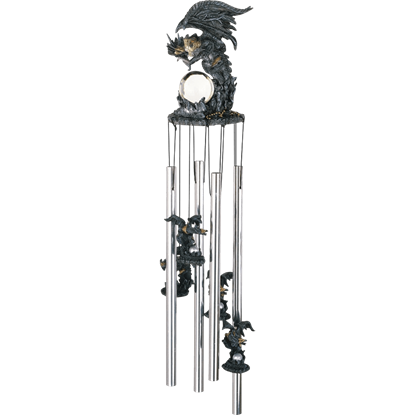 The Dragon with Crystal Ball Wind Chime features a silver dragon surrounded by flames. He is hovering over a crystal ball and wears gold armor for protection. This stunning wind chime is made of cold cast resin and measures 23 inches. The Dragon with Sword Wind Chime features a detailed dragon perched on his tail holding onto a silver sword. In between the chimes there are four other similar dragons. This stunning wind chime is made of cold cast resin. The Dueling Dragons with Sword Wind Chime features two dragons, one purple and one blue, wrapped around a detailed silver sword. In between the chimes there are four other similar dragons, all made in cold cast resin. The Green Crystal Dragon Wind Chime features a highly detailed dragon perched on a cliff of crystals. He is leaning protectively over a crystal ball. In between the chimes there are four other similar dragons. 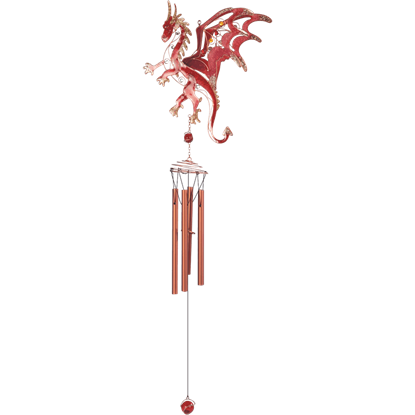 The Red Dragon Wind Chimes may be the elegant fantasy decoration that your front porch has been missing. Your home would benefit from the enchanting tone of the chimes that are hung below a legendary creature.